Eastman is at the forefront of design, innovation and full scale production, producing and exporting clothing of the highest quality to fashion brands across the globe. As one of the pioneer apparel and clothing manufacturers in India and across the globe, we are perfectly positioned to stay on top of the latest trends in the ever changing world of fashion. We work closely with our clients to help convey the reflection of these trends in their clothing catalogue . We have proven our capacity to flex to a fast moving market with a highly responsive portfolio. Whilst the responsibility towards our client relationships remains as strong as it has always been, we are constantly moving forward with an expanding client base of high street fashion brands who depend on us to meet the demands of today's marketplace. Our pioneering outlook and determined spirit, a commitment to creative and technical advancement, competitive quality and value, coupled with years of experience in innovation drives our ability to deliver value adding solutions for the modern apparel industry. 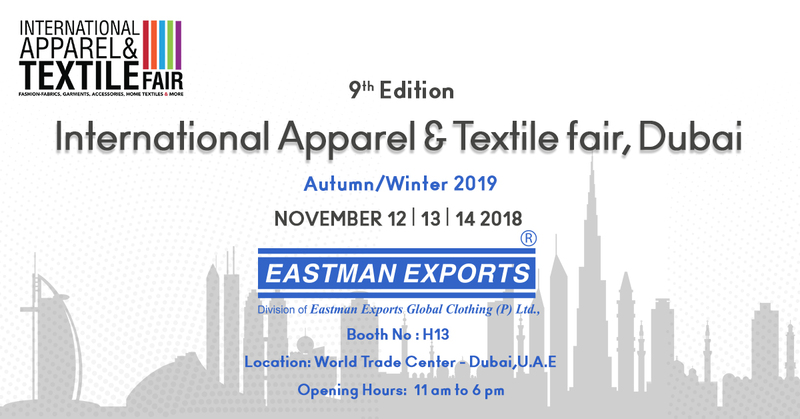 And it is that drive that has once again led us to being a proud part of the International Apparel and Textile Fair (IATF) which is slated to be held at the World Trade Centre- U.A.E (Dubai) on 12,13 and14th of November 2018. The International Apparel and Textile Fair is an exclusive trade only event that will showcase pre-collection Autumn Winter 2019 highlights. The exhibitors from Europe, India, China, Indonesia, Japan, Turkey, and various highly renowned manufacturing countries across the globe will be showcasing the very best of their collections. With the completion of 8 successful editions, IATF is all set for another edition of international exhibition of accessories, components, synthetics for footwear, leather goods, garments and home textiles. Dubai has business visitors from all over the world, making it the 3rd largest re-export market.